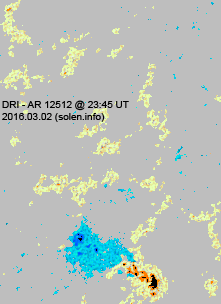 Last major update issued on March 4, 2016 at 04:30 UT. 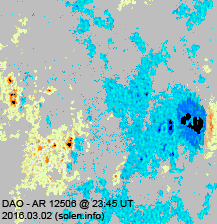 The geomagnetic field was quiet on March 3. Solar wind speed at ACE ranged between 393 and 472 km/s, weakly under the influence of effects from CH717. 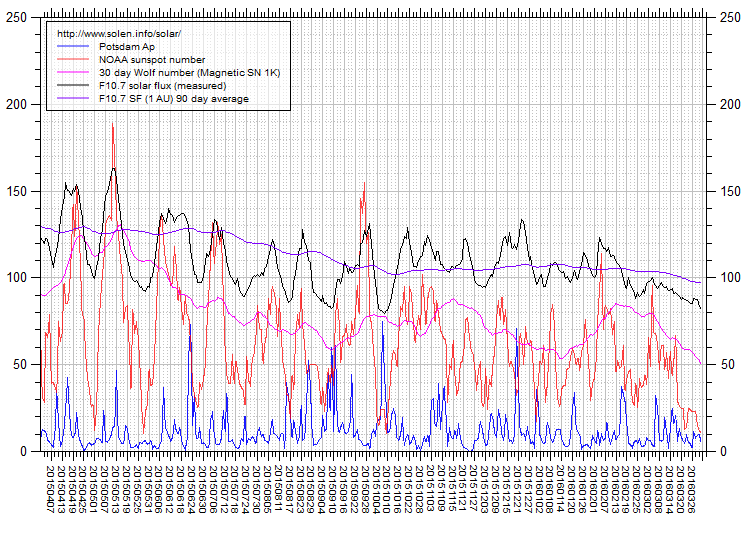 Solar flux at 20h UTC on 2.8 GHz was 98.7 (decreasing 21.0 over the last solar rotation). 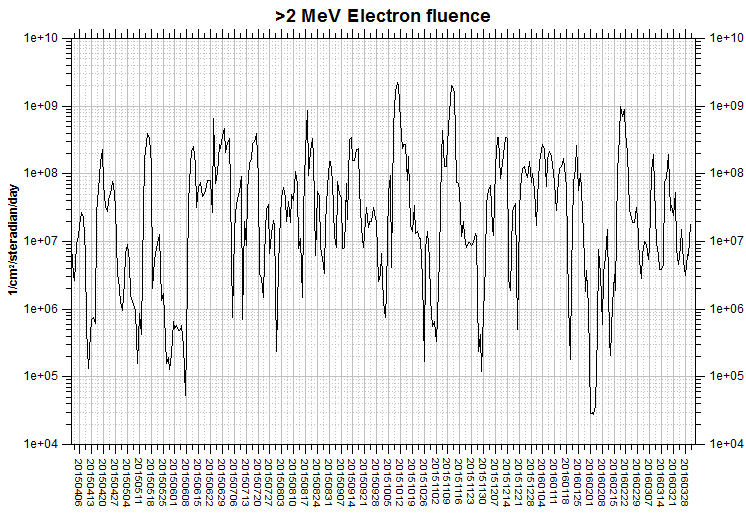 The 90 day 10.7 flux at 1 AU was 103.7. 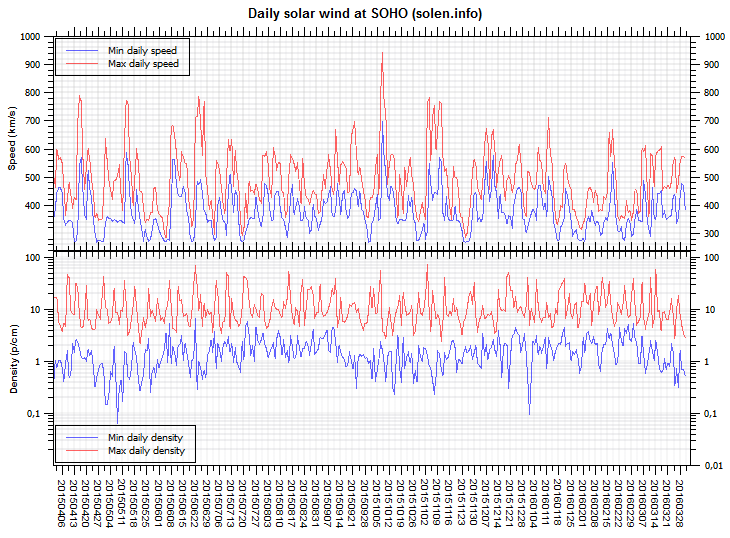 The Potsdam WDC planetary A index was 6 (STAR Ap - based on the mean of three hour interval ap indices: 5.8). 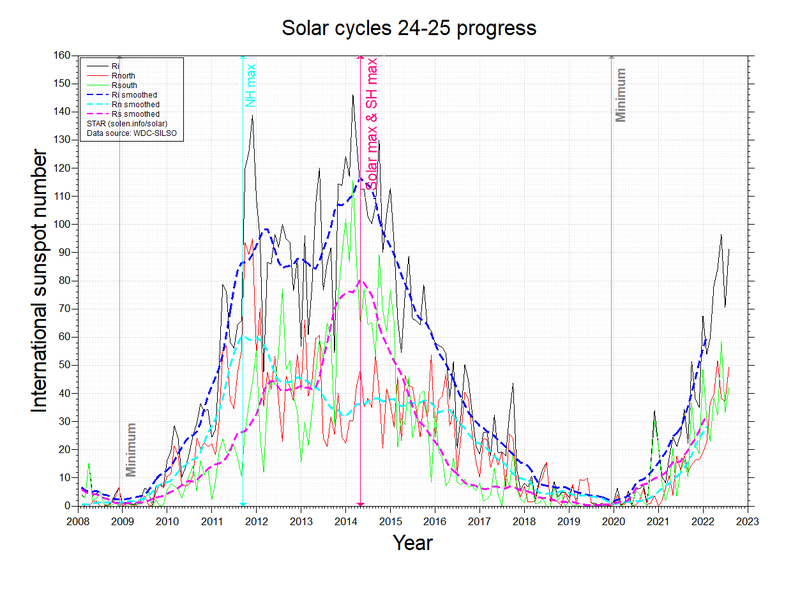 Three hour interval K indices: 22222101 (planetary), 13232221 (Boulder). 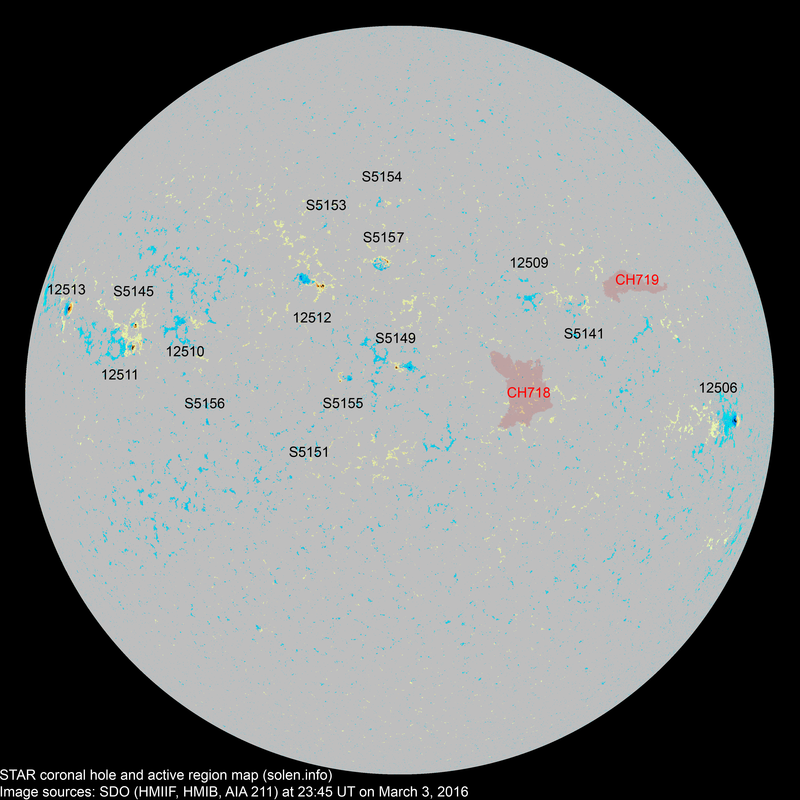 At the time of counting spots (see image time), spots were observed in 15 active regions using 2K resolution (SN: 219) and 9 active regions using 1K resolution (SN: 112) SDO images on the visible solar disk. Region 12506 [S06W63] decayed slowly and quietly. Region 12509 [N09W20] reemerged with tiny trailing polarity spots. Region 12510 [N06E35] decayed slowly and quietly. Note that SWPC has switched positions for ARs 12510 and 12511 in their last region summary, this is highly likely an error. The original numbering will be kept here to avoid data integrity problems. Region 12511 [N03E46] decayed slowly and quietly. 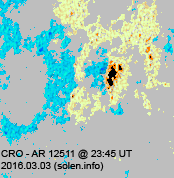 SWPC includes AR S5145 in this region. Region 12512 [N11E12] was quiet and stable. Region 12513 [N11E64] was quiet and stable. S5141 [N08W29] decayed slowly and quietly. S5145 [N07E45] decayed slowly and quietly. S5149 [S02W00] was quiet and stable. S5151 [S10E13] was quiet and stable. New region S5153 [N20E12] emerged with a tiny spot. New region S5154 [N25E03] emerged with tiny spots. New region S5155 [S04E08] emerged with a few spots. 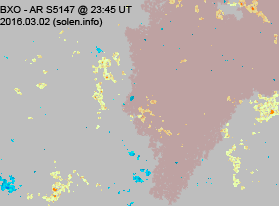 New region S5156 [S09E31] was observed with a tiny spot. New region S5157 [N14E03] emerged as a classic bubble of magnetism and should develop further. An interesting filament eruption was observed near the center of the visible disk from 14:43 in SDO/AIA imagery. No obvious CME was observed in LASCO imagery. March 1-3: No obviously Earth directed CMEs were observed in available LASCO imagery. 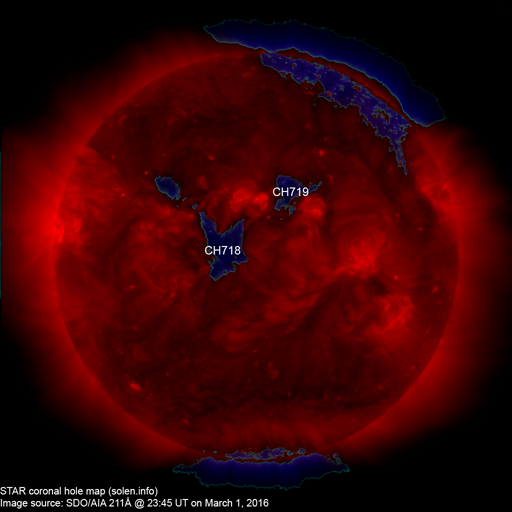 A northern hemisphere coronal hole (CH719) was in an Earth facing position on March 1. A trans equatorial coronal hole (CH718) rotated across the central meridian on March 2. The geomagnetic field is expected to be initially quiet on March 4 becoming unsettled late in the day due to effects from CH719. Effects from CH718 could cause quiet to active conditions on March 5-6.